Lift your heart with the best of today’s songs of faith and worship given that unmistakable Gaither gospel makeover. Enriched with powerful testimony and soul stirring stories. Women of Homecoming DVD 2 gives you a second chance to take a front seat among the best known and best loved female vocalists of Christian country gospel music with all its heritage and tradition. Vocal stars with a great solo tradition of their own - including Amy Grant and Kristyn Getty, blend their voices with this unprecedented gathering of all the Gaither Homecoming Women. The perfect companion DVD to Women of Homecoming 1, here is another 90 souls stirring minutes of powerful gospel message set to the heavenly heart beat of country music. In this second live recorded Christian southern gospel collection, you’ll find great songs of the Christian faith including ‘Nothing but the Blood’, ‘Standing in the Need of Prayer’ and ‘It is Well with My Soul’ all rendered up in the spirit-filled voice of praise and fellowship Gaither Music style. And you’ll find modern songs of faith given a through Gaither makeover, including ‘Indescribable’ and These are the Days of Elijah’, together with powerful testimony and soul stirring stories from the hearts of women whose lives and voices bring the southern sounds of heaven to earth. Women of Homecoming Volume 2 DVD by Gaither was published by Gaither in November 2015 and is our 10708th best seller. The ISBN for Women of Homecoming Volume 2 DVD is 0617884632090. We really enjoyed this DVD, which we found to be even better than the latest two Gaither DVDs, although we have only just purchased Women of Homecoming. It is also better than volume 1 and Allison Durham Speer's humour is certainly much funnier than the male comedian on the DVD of volume 1. 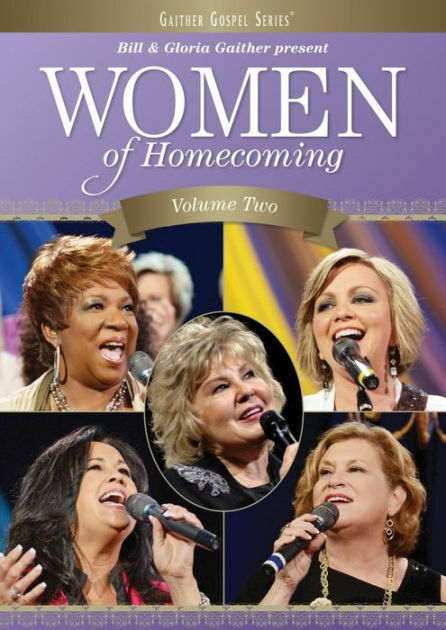 Some of the best female singers from the Gaither Homecoming DVDs are featured on this DVD and we loved each one - laughing and crying with them too, especially Sheri Easter. Got a question? No problem! Just click here to ask us about Women of Homecoming Volume 2 DVD. Christian music's finest female voices unite in this unprecedented musical event hosted by Bill and Gloria Gaither. Women who are making an eternal difference join forces through this multi-generational celebration, which includes more than 90 minutes of powerful music and soul-stirring stories from their lives. Including Kristyn Getty, Amy Grant, Natalie Grant and Gloria Gaither.